For the last year our small school development group has been pondering over the concepts of motivation and self-directed learning. For a long time, these have been rather elusive among our students leading to a lot of teacher frustration. Why do these kids drag themselves to school day after day only to sit in class yawning, fiddling with their mobile phones, learning very little? We looked for reasons in our style of teaching - maybe we are too behind the times and fail to reach today's teens anymore. Partly true, I'm sure. What's more, many of our methods still allow mere passive reception from the part of the students - enough to lull many of them into daydreams or half sleep. Where's the action, active participation, sparking their creativity and curiosity? What about the students themselves? What is wrong with this young generation who don't seem to get truly engaged and interested in much at school? Passivity -often tantamount to apathy - among young people is worrying. It wasn't until December, when we got the chance to visit a motivational researcher at Helsinki University, that I got some new insight into these baffling questions. Her clear message was that teachers may be able to temporarily awaken students' interest in class by using something out of their bag of magic tricks accumulated over the years. Yet, this fleeting moment of interest shouldn't be mistaken for true motivation. According to her, the most important prerequisitive for the development of inner motivation to learn is KNOWLEDGE. A penny dropped for me. When students enter our high school they have already been learning EFL for 7-9 years, and it's amazing how huge the differences in their knowledge are. We receive students who can't formulate the simplest English sentence or utterance, or have any understanding that English isn't simply Finnish translated word by word - which, for example, leads to sentences without any articles, prepositions (as these don't exist in Finnish!) or totally jumbled word order. Put these students together with those who read Harry Potter in the original version in their freetime in a big heterogenous group of 36 and you've got your work cut out for you. No wonder these poor kids can't find the motivation to learn. They simply lack the strategies to process a foreign language, and consequently never have any positive experiences of success in a foreign language class. When it comes to finding solutions we are back to square one. Our fast-paced, too hectic in fact, high school curriculum doesn't allow us to start from scratch with the students whose previous knowledge is insufficient. Should we just consider them lost causes and concentrate on those students who more or less get it? After all, students can stop formal schooling at the age of 16, before entering senior high school, so there is no obligation to graduate from senior high school. I must admit I feel very uneasy about abandoning young people like that. Of course, we try to guide them to search for private tuition, but not all of them can afford it. 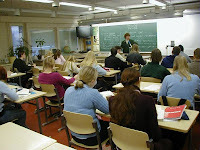 In the past students used to be grouped according to their level so that it was easier to find the pace that best suited each level, but it was soon found out that the lowest achieving groups got branded as failures, which so demoralised them that the system was abolished years ago. Yet, the present system doesn't seem to work for them much better. This is probably yet another one of those eternal pedagogical and social dilemmas for us teachers to discuss and work on.